This is the point within cycles that it gets more difficult to call market movements as the bottom nest has completed and you have shorter cycles up and down. 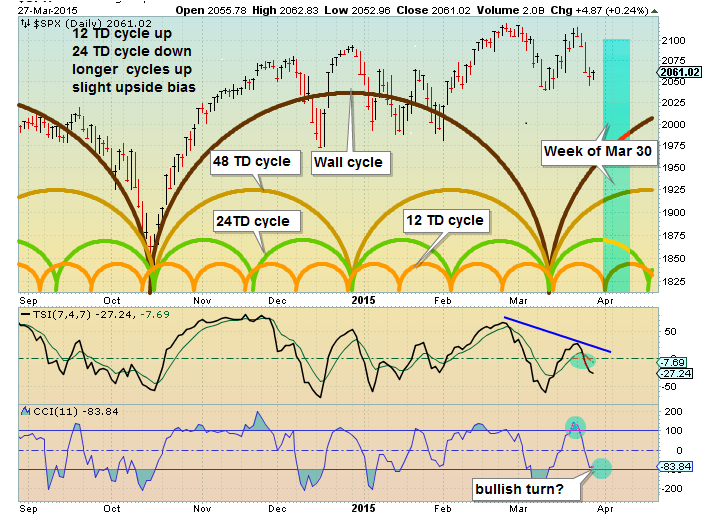 The 12TD cycle may have bottomed (or should soon) and turn up. But this is mid-cycle of the 24TD cycle which should top and turn down. So these 2 cycles should offset to a large extent with the shorter cycle showing movement over a shorter span. Also the longer cycles are up. So there should be a bias to the upside over the next week, but volatility probably continues. I thought the 12TD cycle had bottomed and should turn up. The 24TD cycle turned down, but being a longer cycle it has a longer turn radius (slower to move down than the 12TD turn up). Looks like the 12TD cycle took a hard up turn this AM maintaining the expected volatility. May get some moderation by days end? Appears market should be up 3 more days (closed Good Friday) to place the 12TD cycle at a top on Thursday or possibly Monday AM. As I commented the 12TD and 24TD cycles would offset to a large degree. Over the last 4 days SnP is up by about 2 points with the expected volatility. Do we end the up half of the 12TD cycle (Monday?) with the upside bias as expected?? Two days up (Friday Mar 27 and Monday Mar 30; down March 31 and April 1). At Midday April 2 market up. Over 4 days moderate gain, with the expected upside bias as first the 12TD cycle takes over (up) and then the 24TD cycle takes control (down) as two shorter cycles offset as I suggested was possible.